Most of you have probably heard that I’m writing a script for one of the episodes of Season Two for the Outlander/Starz TV series. This is new and interesting—I’ve written comic book scripts for Walt Disney (waaaay back in the late 70′s) and I’ve written the script for a graphic novel (THE EXILE— for those of you who haven’t encountered it, it tells the story of the first third of OUTLANDER in graphic novel format—from Jamie’s and Murtagh’s point of view)—but I’ve never done a script for TV or movie before. Now, I have read a few of these. 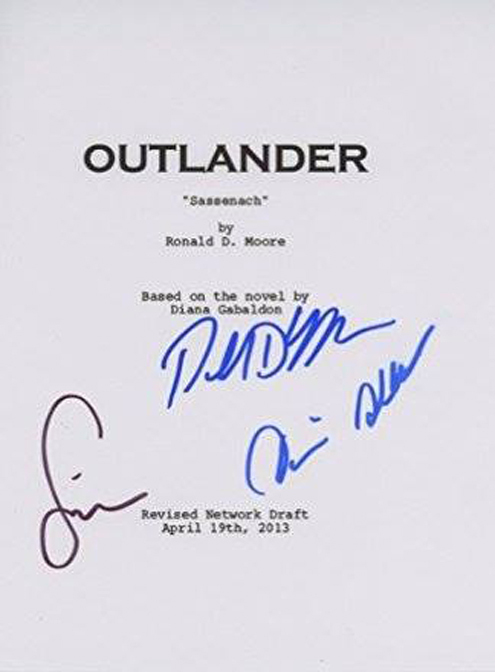 During the period when the books were under option to various producers who wanted to make a two-hour movie of OUTLANDER (something that is flat-out impossible to do, but many valiant attempts were made), I saw several movie scripts, most of them written by very reputable screenwriters. These were each uniquely horrible, but instructive. Then along came Ron D. Moore, and a TV series. While you still can’t fit a 300,000 word novel into sixteen hours of television, you can do a much better job of adaptation. And as I told Ron, after he showed me his pilot script for the first episode, "This is the first thing I’ve seen based on my work that didn’t make me either turn white or burst into flame." I was coming into the Final Frenzy on MOBY and knew I wouldn’t have time to breathe, let alone take on a challenging new project. Now prior to this, the script/book has been "broken"—literally. The original book has been taken apart, scene by scene, and all the lines of original dialogue stripped out and listed, so the writers can use as much as possible of the original language, even though it may sometimes occur in a different context. The Writers Room collectively then sorts through all these pieces, and reassembles them (roughly) into however-many episodes the season has. Given that each episode is roughly 57 minutes, and that each episode has to have its own dramatic arc (you can’t have an entire episode of exposition, whereas you can do whole chapters of it in a novel. I don’t recommend that you do that, by the way—but you can), the book material is not going to fit neatly and contiguously. Ergo, the chronology of the story will be roughly the same: the events that take place in Paris obviously precede the events of the Rising in Scotland, and Jamie’s friendship with Charles Stuart naturally has to come before Claire treats the monkey bite on the Prince’s hand, and Jamie’s duel doesn’t take place before he meets the man he’s going to challenge. BUT… smaller pieces of the plot that aren’t necessarily linear may be moved, or flexed a little, or even separated into still smaller pieces that can be included in separate places, in order to achieve an interesting, coherent and more or less self-contained episode. AND in service of this goal, small new pieces and lines may need to be created to blend and support the original pieces in their new configuration. This is why I was telling people (in response to pre-Ep 15/16 hysteria) to put down the book and enjoy the show. They aren’t gonna be exactly the same (for the reasons described above)—but with luck, goodwill, determination and talent (all of which the Outlander production team have in spades), the result will indeed be recognizably "Outlander"—and sometimes perhaps even an enchantingly novel Outlander. So I went and spent a very entertaining day in the Writers Room. 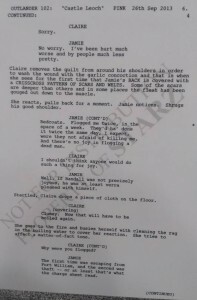 The script had already been "broken," so we knew how much material would be included in Episode 211, but not how it might be arranged, or what might or could be tweaked or added to give an exciting, coherent structure. The rough layout for Episodes 210 and 212 were also on the board, on either side of 211, along with a very rough notion of 213. (Yes, I know how it ends. No, I’m not going to tell you. It will be fine. Don’t worry.) I could therefore see how some elements of what I was handling would look coming out of 210, and should look, going into 212. What followed was a mass mental jigsaw puzzle, with everybody moving pieces, suggesting new things, arguing about them, vetoing this, approving that, and fitting everything together. The writers were all doing this en masse on the couches, while Richard, the writers’ assistant, and Mike, the script manager, were on Aero chairs at the back of the room with their laptops, taking down everything we said and the conclusions we came to—these being the "room notes," which were forwarded to me afterward. Anyway, the Studio/Network notes were minor enough that Ron told me to "go to script," rather than re-drafting the outline, and so I did. They’re right about that; it was easy. Much, much less interesting than putting the pieces together as you invent them <g>, but certainly easy enough—and I did get to make up the dialogue and insert entertaining (well, to me, at least) bits of byplay and business. First Ron and Maril will read the script and give me any notes they have. Depending on number and complexity, I may redo the script to address those or just add tweaks here and there. Once Ron’s satisfied with it, it goes—once more—to Sony and Starz, who both get to make notes, which may require various fixes (or not so many, if we’re lucky. Who knows?). The script might go through three, four, five iterations before it becomes a "Production" script. But that’s not the end of it! And above all—it depends on how the script "plays." Can the actors do the lines without repeatedly cracking up? (I’ve seen a couple of scenes where they couldn’t. In one such series of takes, after the fourth try ended in giggles, Sam Heughan is saying, "This is never gonna work," and you can hear the director saying firmly in the background, "Yes, it is!" (It did, too, but it took a while. Sometimes persistence will do it, and sometimes the writer (or the actor, or the director) changes the line.) Is the scene physically awkward in some way that only becomes apparent when the actors block it? Does it run too long? Is some speech badly phrased, so it sounds stilted? Does the action need to be re-arranged in order to accommodate camera angles or scenery? Do the actors and/or the director like the script, or do they feel strongly that this or that isn’t working? All these sorts of things have to be fixed on the fly, as it were—which is, I assume, why the writer needs to be on set while his or her script is being filmed. I will say that I’ve seen seven or eight iterations of a script done after the ‘Production’ version. P.S. I had breakfast with George R.R. Martin shortly after the agreement that I’d do a script, and mentioned it to him—knowing that he’d done a good deal of television writing before taking to novels. He laughed and said, "Oh, so you’re about to learn the Great Secret of screenwriting!" "Reckon so," I said. "And what’s that, George?" He leaned toward me conspiratorially and said, "It’s MUCH easier than writing a novel!" Also posted on my Facebook page on August 24, 2015. Thank you so much for giving us this peek behind the curtain. Your explanation was so interesting to read. What fun. I know I can’t wait to see episode 211. I thoroughly enjoyed reading your interesting and informative insight, thank you! I’ll enjoy the screen episodes even more now, not that I didn’t enjoy them before, of course, but this gives a whole new dimension to watching. I’ve always loved the books and the way the screenplay literally brings them to life, thank you,Diana for creating them. Good For You!!!!!!!!!!!!!!!!! Cannot Wait for Season 2……..and I have even told people on FB……..it is Mr. Moore’s interpretation of your story……………my Husband even loves it!!!!!!!!!!!!!!!!! Congrats!!!!!!!!!!!!!!! That was a wonderful description of the process, thank you! I’ve dabbled in script-writing and now I see why I struggled – didn’t have a team to go through it with me. I would love to sit in on the action in the Writer’s Room. Thank you again for Jamie and Claire. I’m a true fan! Congrats! New things for you to keep those creative juices flowing! 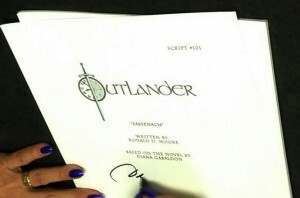 I read Outlander when my youngest daughter was a baby..and now, at age 24, she is reading the series. We both love the STARZ show especially when it stays close to the actual story you wrote. Keep them in line girl! HUGZ! When is season 2 due to air….love love love it! But then, many kudos for giving them such a solid foundation to begin! intrigued with RR’s summation comparing script development to novel. My naivity for author’s who have achieved your stature, editors would just take your manuscripts on reflected knee and bowed head and run for the presses! My apologies. I just found your explanation of ‘What finished means to a Writer. Thank you for explaining the process you are experiencing going from novel to screen. I really have enjoyed the knowing the steps involved with first your steps in publishing your novel and now stepping into the shoes of a screen writer. I appreciate the details and your thought process. I read the first four books years ago- when they were first published and a year ago heard some of my younger coworkers talking about the outlander books. I was excited to join in and talk to them about the books and then they told me of the Starz series ! I really love the adaptation and don’t feel they have left much out that was essential. I guess I don’t need every word verbatim from the books so… I have since re read the first 4 books and the next 4 ! Thank you for writing such detailed characters and story. I hope to keep enjoying your creativity and adventures with your characters. Thank You ! It was nice to read how books go on scripts. It no easy. When I saw first Outlander Episode in TV. In Finland TV. I do no like it, but now just waiting when Outlander continue in Finnish TV next year. I just read Dragonfly in Amber. In the book will be a lot of good and bad things. Happiness, passion, grief, etc. How make a good screenplay. 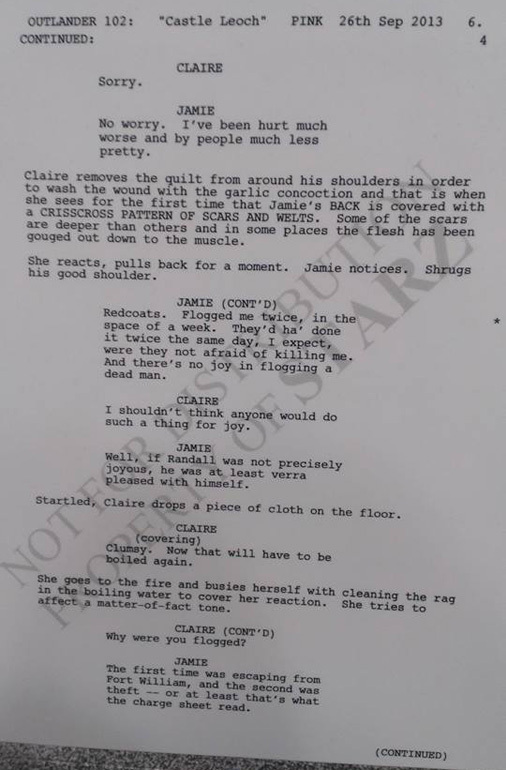 Jamie´s and Claire´s love story. It is for adult. This story is beautiful and realstic. Not any “humpple pumpple”. Leading actors make a story in TV. Sam is very talennted actor leading role and just be himself and do Jamie´s role. Thank you Diana for taking the time to explain in detail what screen writing is all about! I have an interest in film making and am still amazed at the internet, how I can connect with your blog and read your thoughts on different subjects. I’m not sure I would have the patience you exhibited in this post but I’m glad you did. The Outlander series is exceptional in every way and a breath of fresh air for creative film making. Always amazing Diana, thank you for taking everyone on this journey with you in various ways. I love that you had lunch with Mr. Martin….. two of my favorite authors. Had to be an interesting conversation.